Roasted veggies add depth and flavor to a creamy noodle kugel. Good news for those of us avoiding gluten- Tinkyada brown rice spaghetti or white rice spaghetti makes for a terrific noodle for kugel. Who knew? I love a savory kugel (who doesn't?). This gluten-free update of a classic creamy noodle dish is pure comfort food. I added roasted vegetables for extra flavor and nutrition. Kugel takes a little time to prepare but is well worth the effort. 1 tablespoon dried herbs, to taste - Italian or Greek mix, dill, basil, oregano, etc. Toss the veggies and garlic in a roasting pan with enough olive oil to coat. Sprinkle with sea salt, pepper, herbs. Roast the veggies until tender, stirring half way through, about 45 minutes. Remove from the oven and set aside. Generously grease a large shallow baking dish (lasagna-style dish) with butter, olive oil or margarine. In a large mixing bowl whisk the eggs with the sour cream, sea salt, pepper, and nutmeg until well beaten. Stir in the shredded cheese till well mixed. Layer the noodles in an oiled lasagna-style baking dish. Add the roasted vegetables. I arrange the larger pretty pieces on the top. Pour the egg custard mixture evenly into the pan. Press down for a minute or two with a spoon to encourage the custard to seep in and around the layers of noodles and veggies. 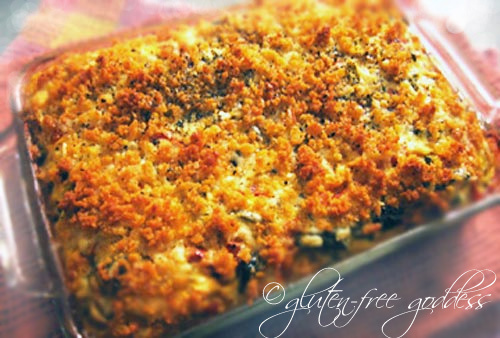 Sprinkle with nutmeg and parsley, a layer of Crunchy Gluten-Free Bread Crumbs, and some extra Parmesan, if desired. Bake at 350 degrees F for about 55 to 60 minutes (depending upon your oven) until the kugel is golden brown around the edges, and the custard is set all the way through. I check mine with a thin knife inserted into the center; if it's dry and not wet-eggy, it's done. Allow the kugel to rest a few minutes before slicing and serving. Serve with a crisp green salad dressed in balsamic vinaigrette. Do you have any suggestions for substitutions for zucchini/squash? A cup of chopped cauliflower would work; and you could also add another carrot, or a chopped yellow pepper. Mushrooms could work as well. If you leave out both squashes, you'll need about two cups of chopped veggies to replace them. Do you ever make sweet kugels? Yes, I do make sweet [dairy] kugels, too. Check back. And yes, winter squash works - I often use it in this recipe. Enjoy! Do you have suggestions as to how to make this kugel dairy-free (no sour cream/cottage cheese, or shredded cheese)? Thanks! Happy Rosh HaShannah to all those celebrating! There are nut milks and cheeses that are gluten-free and non-dairy [made from almonds]. I think they would work quite well. Check in your local health food store or Whole Foods. The almond cheese I've seen says gluten-free right on the label. For nut milk, I know Almond Breeze is GF. And I believe Pacific makes a GF nut milk. There is also the soy possibility [if you can do soy; I do not recommend soy (especially for celiacs or gluten sensitives) because of the thyroid connection]. I'll look at the nut milks and cheeses - they'd have to be dairy, gluten, and corn free though, which is tough to find. Maybe I can find a soy sour cream since small amounts of soy are OK.
Almond Breeze in original and in chocolate are awesome! Do you have information on this: "There is also the soy possibility [if you can do soy; I do not recommend soy (especially for celiacs or gluten sensitives) because of the thyroid connection]." Have never tried a kugel before(dont know what it means) but the recipe sounds delicious and am going to try it soon. I also wanted to know how to make sour cream at home. Hi Anon- Sorry I'm just now getting to your question. Google soy + thyroid and you'll find a lot of info; soy is estrogenic. Anupriya- Kugel is a Jewish dish. This kind of kugel (with eggs and noodles) depends on eggs. It's a baked custardy-quiche kind of dish. There's really no substitute for eggs and sour cream. I will be experimenting with a vegan almost-kugel. Soon.